For someone who’s supposed to be good with words, I use a lot of emojis, or emoji if you’re the kind of person who says “stadia” instead of “stadiums.” There are two in particular that I use every day, all day long. The first is the happy face with two open hands on either side—sometimes interpreted as a hug, or as I see it, an expression of joyful excitement. 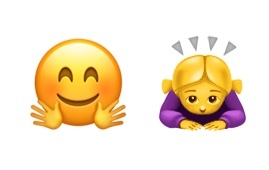 The other is a girl with her face in between her hands as if she is banging her head on a desk—for me, the depiction of overwhelm, frustration, and despair. It’s not right to say that my life exists between these two electronic hieroglyphs but rather that it is usually one or the other. Book a trip to Las Vegas, see the sun come out, make it to school on time—🤗. Forget my laptop password, overdraw my bank account, lose a library book—‍🙇‍♀️. Almost every message I get on my phone can be answered with one of those two reactions. Dichotomous, that’s my life, probably because that’s how I like it. Not for me the steady grind of a well-organized and diligent existence. Not for me consistent contentment. Nope, its big fun, big love, big adventure, or it’s oh god why me, or not that again, or why can’t I ever do this right? Those daily jumps between high and low mute all manner of tediums (or tedia if you’re the kind of person who says “syllabi” instead of refusing to refer to more than one syllabus) and help me avoid that first-world luxury, boredom. There have been years full of head-on-desk moments, like when my first husband left and subsequently my daughter’s kindergarten teacher told me my formerly ebullient five-year-old had stopped skipping everywhere she went. I didn’t have an emoji for that then. But today, when my daughter texts me a picture of a book she’s reading, or my best friend says she can meet me for lunch, or my husband writes, “I can’t wait to see you later,” I know just what to say: 🤗🤗🤗.